Who or What is a Creative? 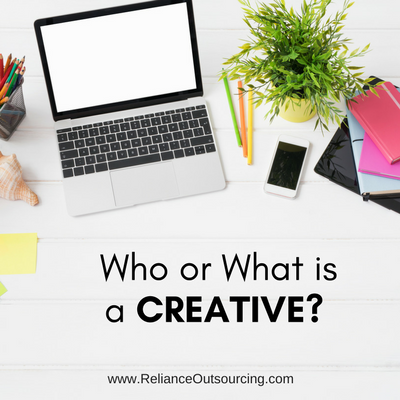 I have been thinking about businesses and people that call themselves “creatives.” What exactly is a creative? The first example of creativity that comes to my mind is art—painting, sculpting, designing (jewelry, furniture, rooms). Today, though, the description of creative goes beyond that. A creative professional who is also known as a creative specialist is a person who is employed for the extraction of skills in creative endeavors. But still, there are many definitions that can fall within the sphere of “creative endeavors.” Take this article posted on Playground, Inc. The list of creative businesses in this article are vast: engineers, graphic designers, art directors, consultants, advertising, and digital. One of the values of these types business identified is innovative. I notice that writing is not a part of this article. In my estimation, it should be. As a virtual assistant, I feel the need to be innovative in all of my work. This includes writing, but it also includes social media and administrative work—actually, most everything that I do (including graphics). If I am not creative, a couple of things happen. First, I don’t use my imagination, so I just “do” what is in front of me. I don’t think beyond the task at hand. It becomes meticulous, boring, and I don’t give my client’s my best side. If I allow my creative mind to flow, I work much better. I treat my client’s needs as if they were my own. I take ownership, and I work with flare and enthusiasm. I do this with an open mind, and this leads me to identify and make recommendations for change, or to go beyond the call of duty. As a creative I ask questions as I work: Can I make this sound better? Can I make this look better? What atmosphere do, or can, I create? When I look at the task at hand with fresh eyes, as if I were the designer, I see beauty in most everything. That is being a creative. Tell me, what is your idea of a creative? How do you blend it into your day-to-day work, or do you?